As all schools are required to operate risk management. In this article, we look at some key hazards associated with having a leaking school roof and what you can do about them. If you are involved in school risk assessment, why not use this list to familiarise yourself with some of the hazards and make the case for resolving a leaking roof. The ingress of water caused by a leaking roof (or the buildup of moisture caused by interstitial condensation) can represent a significant fire risk. Water will track along beams and within ceiling voids where electrical wiring and lighting is often situated. If this water comes into contact with circuitry, it can cause shorts, sparks and electrical shocks. This represents a significant hazard which can put pupils, staff, and the building itself at risk of injury or death. Slip and trip hazards are commonly covered as part of your premises risk assessment. If water is dripping from a leaking roof onto floors and corridors, this puts pupils and staff at risk of slipping on wet floors. Leaking water can also cause trip hazards. Timber and other flooring can warp and lift when exposed to moisture, exposing pupils to the risk of tripping. If a leak is ongoing which is not uncommon in schools, you may have sought to temporarily mitigate the risk by placing buckets to catch the drips; but these themselves also represent a trip hazard. The worst example I’ve seen is a leak onto a staircase landing with heavy duty vinyl flooring which was lifting. This created a potentially fatal trip hazard. Dirty rainwater dripping through insulation can’t be good for the health, however both damp and mould represent a recognised hazard, particularly to children and those with allergies and asthma. Moulds produce allergens, irritants and in some cases toxic substances. Inhaling or touching mould spores may cause allergic reactions and asthma attacks. Whilst PE changing rooms and showers will be most susceptible to mould, leaking roofs can also create this hazard elsewhere in your school. This is a problem recognised by the NHS, WHO and teacher’s unions. From damp, leaky buildings to serious issues like exposure to asbestos, too many pupils are trying to learn in classrooms that are damaging their health – and their education. As well as causing electrical and fire hazards, water can damage electrical equipment, from kettles and printers to computers and laptops. 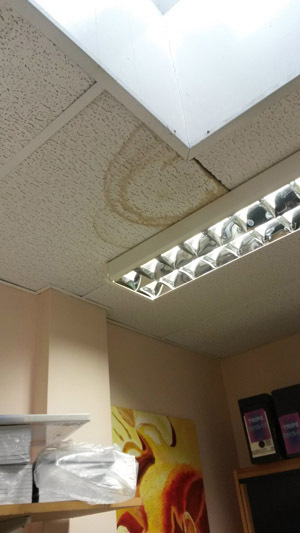 Why bid for a new IT suite when your roof is leaking? Make sure the roof is sound first, or the investment will go down the drain. In addition, water leaks can damage floor finishes and other equipment such as carpets, desks, chairs and furniture, along with stored materials and equipment. It isn’t unusual to find a whole store room full of ruined stationery when a school roof has been leaking. As well as causing damage and water stains to carpets and furniture, water leaking through your roof will be damaging the building fabric itself. A well-designed roof will get water off quickly into downpipes and drains. If the membrane has failed, that same water will build up on the roof and sink through the roofing layers damaging everything in its wake. You may first notice when the ceiling tiles become stained, but later they may turn to mush with prolonged soaking and drop onto the people, equipment and floors below. However behind this obvious sign is something much more hazardous. 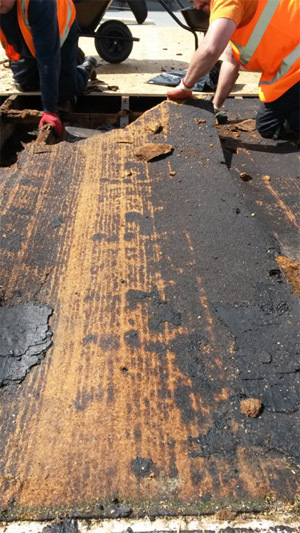 Flat roofs are often boarded with plywood, which can delaminate and become fragile with prolonged water damage. This will create risk of collapse, which may be exacerbated if there is a trespass on the roof. In this way, prolonged water damage can constitute a major risk to your school. When you’re involved in school risk assessment the principle is to eliminate as many hazards as possible, and only seek to mitigate those that cannot be eliminated. As we can see from the examples above, there are several hazards associated with a leaking school roof. If the problem is not dealt with, even the simplest of effects can create knock on hazards and associated costs to the school. 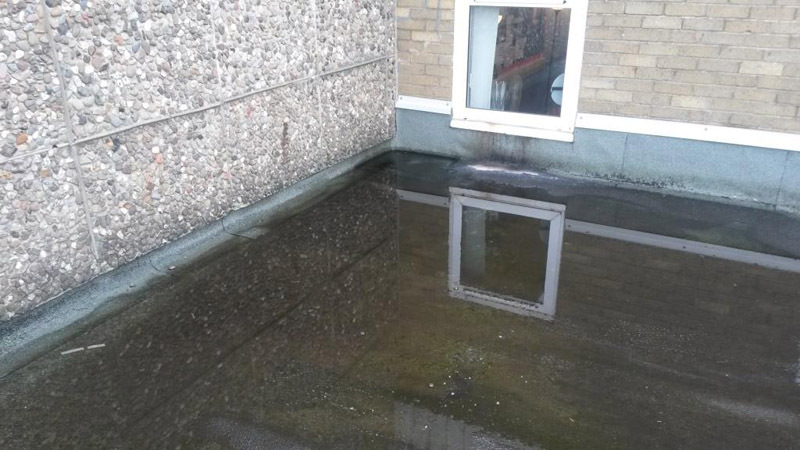 This is why ensuring the schools roof is intact and performing properly and repairing any leaks is essential. Got a leaking roof? If you suspect a leak in your roof do NOT climb up onto the roof, call an expert in. Let us come and check it out and see if you might qualify for funding for the repair or replacement, and remove these hazards altogether. 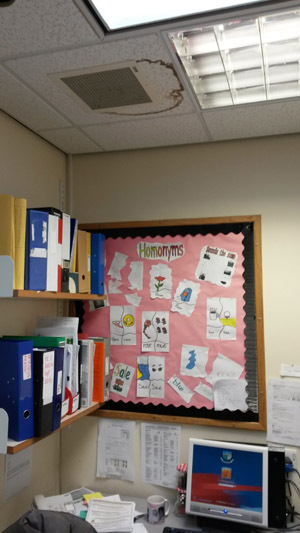 According to the Control of Asbestos Regulations 2012, the employer is responsible for managing asbestos, which means an academy school’s governors must manage any asbestos risks in an academy school. Academies should implement an Asbestos Management Plan which will include roles and responsibilities, information about the property and Asbestos Containing Materials (ACMs) and an emergency plan. Thanks for this informative article. I am planning to take the roofing exam. This will help me in my studies. I am also looking up some prep school who can help me with the review.